When I start describing the magnetic field moving through space, I speak of the E- and B- fields and wave my arms and you may imagine that I can see them. I’ll tell you what I see. I see some kind of vague, shadowy, wiggling lines… and perhaps some of the lines have arrows on them—an arrow here or there which disappears when I look too closely… I have a terrible confusion between the symbols I use to describe objects and the objects themselves. Is something being represented here? Some inner landscape? Some alien world deserted by analogical figures? Are these Turners, minus the trains? 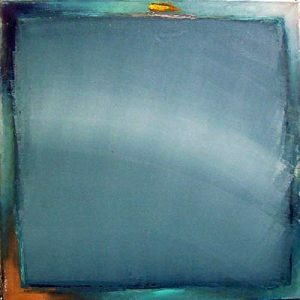 Or are the colours and the shapes, the rythms and the symmetries, the densities and the fluidities simply displaying the passive, wordless mystery of their immanence? 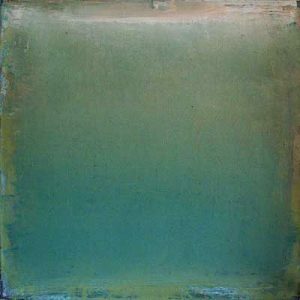 Chromatic variations shimmer and dampen in turn : blue fades into green and grey gives birth to cream, following the shifting, tidal equilibrium that dominates these paintings. 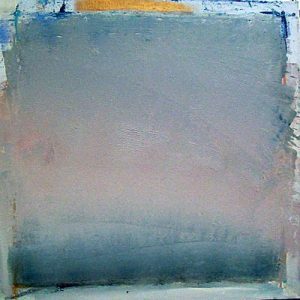 Modes are explored, tonalities conjured… They breathe their wounded, oceanic breath as underlying light washes into the rippled softness within. But what is this weightlessly ethereal substance? And whence does the insinuating radiance emanate, which can find its way through the gently cascading occlusions—the siren songs, the sooty layers of depression? Confronted with these brooding, meditative pieces, one can’t help but feel drawn in by the obscure forces that animate them: the viewer’s attention is absorbed by the exquisitely modulated vortexes, by the volutes of sentient mist that descend into the visible field. Witness the suspended motion, folded into the flatness of the plane; witness the swarming strands of colour, imprisoned by the harsh edgelines that separate the surface of pictorial representation from all other potential surfaces… Arrested in contemplation of these delineated panes of muted or surging or seeping frequencies, what one gradually understands is that they represent no coherent vista; they are not windows and can offer no perspective, because the inchoate world they reveal can only manifest itself as sedimentary nuances of pigmentation and opacity. They are paradoxical portals—thresholds to a primal nether-limbo of feeling experienced as colour and rythm : a wanton flood stirs within, bound by lines that prevent its unraveling into the void beyond the frame. Something has been lost; something is missing. Chaotic signals have been mistaken for beacons, and now, a hushed longing radiates out of these abysses of trapped colour, intangibly dissipating the secret, knotted heart of their intensity… This energy charges the room where one stands facing the ghostly manifestations of its presence, churning on the canvas. One experiences Majka Kwiatowska’s etiolated shades of blue and pink and grey not through saturation, but rather, by means of a slow process of infusion whereby the gazer is momentarily lost in a world of nocturnal echos, rosy-fingered silence and formless melancholy—out of the cradle, endlessly rocking… In the end, Majka Kwiatowska’s pulse, her voice, her freedom—all of her compelling primeval intimations—prevail through a kind of vague dispertion, a benign contamination.